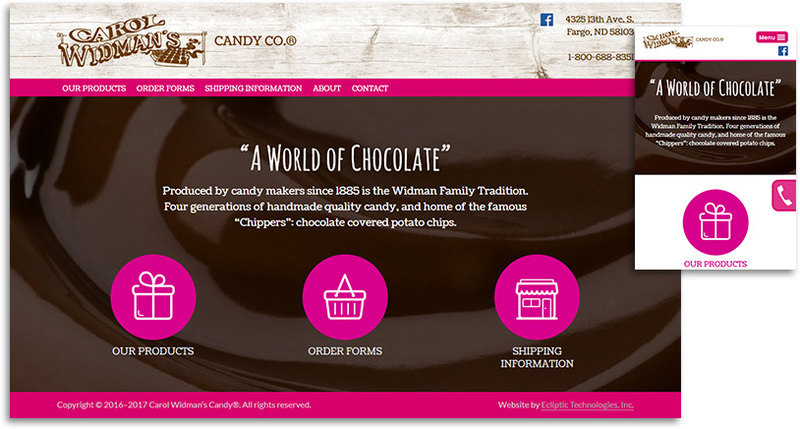 Carol Widman’s Candy Co. continues the original Widman tradition of handmade-quality candy—spanning four generations—developing a special quality of product and unique use of ingredients, including their famous chocolate-covered potato chips or “chippers”. Carol Widman has been a staple in our community and in the confectionary community for many years. We were thrilled to have the opportunity to partner with Carol to develop her new website to better showcase her delicious offerings and direct customers to their order forms. Our design process focused on displaying their seasonal offerings and ensuring her customers have quick and easy access to ordering information.